The first time I attended The Moth, I felt like I had stumbled upon a secret. I walked into the dark space of Douglass basement to find the couches pushed together as an attempt to create a sense of intimacy in the cold and open room. There were no microphones and no equipment. The space was only filled with storytellers and people who were there to listen. Without the crowds and the large production of Covers, it was immediately apparent that this was a different kind of Goliard event that prioritized community and inspired me to return the following month to stand up and tell my own story. The Moth is an open-mic storytelling event hosted by The Goliard. There are only a few simple rules: participants are given a theme and tell a true, unrehearsed story from their life based on their own interpretation of the theme. The stories can be funny, sad, strange or anything in between, and the events are open to all students, whether they want to tell a story or just come and listen. For the past few years, The Moth has been coordinated by Megan Murphy ’19 and Dylan Reynolds ’19, two poetry and prose editors for The Goliard. Nowadays, The Moth is held about once a month in Old Main, where the cozy atmosphere lends itself to the intimate-but-casual feel of the event. 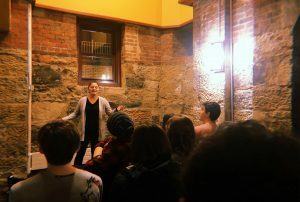 The Moth borrows its name from the popular storytelling podcast to maintain a sense of familiarity with the event, but the concept has been repurposed for the Wooster community to provide a different kind of open-mic event. Each month, Murphy and Reynolds select a theme for the event which is typically one word that brings a personal story to mind right away. The themes are always open to interpretation and meant to act as sparks of inspiration. Two new coordinators for The Moth will take over in the fall: Alex Doone ’21 and Eliza Letteney ’21. Both Doone and Letteney share a similar perspective on the role that this event plays within the campus community. Although the event prioritizes an intimate sense of community, the event is never exclusive and always welcomes newcomers. Murphy emphasized that although people tend to associate this kind of event with the humanities, it’s open to the entire community. “I think sometimes ‘open mic’ has an elite sort of literary connotation …” she said. “But we don’t even have a microphone,” added Reynolds. If you’re interested in telling your story, or even just coming to listen, there is something for everyone to learn at The Moth. Look out for their announcement of their next event on The Goliard’s Facebook page.